It's #NationalPieDay!! 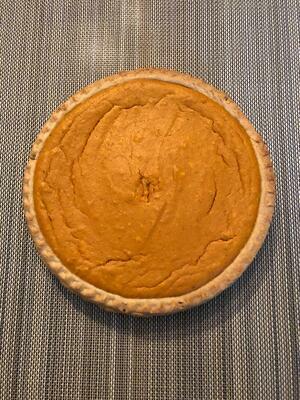 So of course I had to share one of my favorite Renaissance recipes, one for a pumpkin tourte. Pumpkin pie in the Renaissance? I hear you say. Isn't that a food from North America? Why yes, but let me explain. In renowned chef Bartolomeo Scappi's 1570 cookbook, he describes a pie which includes a recipe for a gourd that translates as the word "pumpkin." Now, the word for "pumpkin" has been used on a variety of gourds throughout the centuries, dating back to ancient times. It's possible that the pie he describes was actually a squash pie, but with the influx of foods from the new world (Scappi also includes some of the first European recipes for turkey in his book), I like to think that perhaps the pumpkin that we know and love today might have been what Scappi was using when he created this recipe. You'll notice that my version cuts a few corners. We have the luxury of canned pumpkin, of course, and that makes life a lot easier. The "creamy cheese" is somewhat ambiguous, so I went with what we know as cream cheese, although marscapone would probably be a closer bet. I've not tested it with marscapone, so if you do, let me know what you think! Note that the ricotta doesn't blend super smoothly, but the flavor and texture is not affected. If desired, you can add this filling to a pie shell, store-bought or home-made. If making the shell, I recommend King Arthur Flour classic single pie crust recipe. To be more authentic, use rosewater instead of water to bind the dough together. To prepare a tourte of domestic pumpkin without a shell. When the pumpkin is scraped, cook it in a good meat broth or else in salted water and butter. Then put it into a strainer and squeeze the broth out of it. Grind it in a mortar along with, for every two pounds of it, a pound of fresh ricotta and a pound of creamy cheese that is not too salted. When everything is ground up, put it through a colander, adding in ten well beaten eggs, a pound of ground sugar, an ounce of ground cinnamon, a pound of milk, four ounces of fresh butter and a half ounce of ginger. Have a tourte pan ready with six ounces of very hot butter in it and put the filling into it. Bake it in an oven or braise it, giving it a glazing with sugar and cinnamon. Serve it hot. Preheat oven to 375°. Cream together milk, sugar, eggs and butter. Add in cream cheese, ricotta, pumpkin, ginger and cinnamon. Blend until smooth. The mixture will be very liquid. Pour into two heavily greased 9” pie pans. Cook for 45-50 minutes or until a knife inserted into the center of the pies pulls clear. *Note that fresh ginger is better; dried ginger lacks the punch needed to spice this pie. If you make this dish, I'd love to know how it tasted! Share your photos online with the hashtag #TheChefsSecret. And guess what? If you pre-order THE CHEF'S SECRET, you can get a free download of the companion cookbook, with this recipe and three other delicious pies and many more recipes to boot!